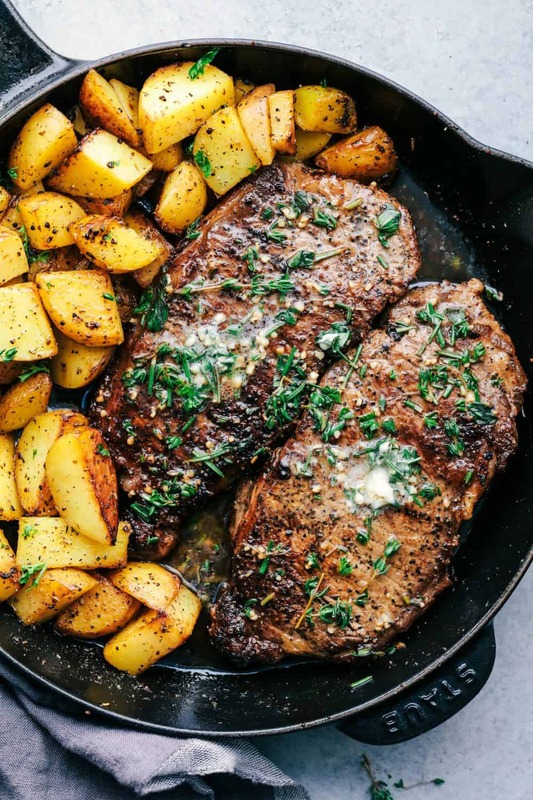 Skillet Garlic Butter Herb Steak and Potatoes is pan seared and cooked to perfection and topped with a garlic herb butter compound. This is the best steak that I have ever had!! My youngest son is such a steak and potatoes guy. He won’t eat anything else but I can count on him to eat a good steak. He actually was in the kitchen with me helping me make this recipe. He loves to cook with me. He even told me to make sure to “sear the steak”, and to give the potatoes a slightly “charred” edge. With his help, we were able to create one of the best steaks that you will ever eat! 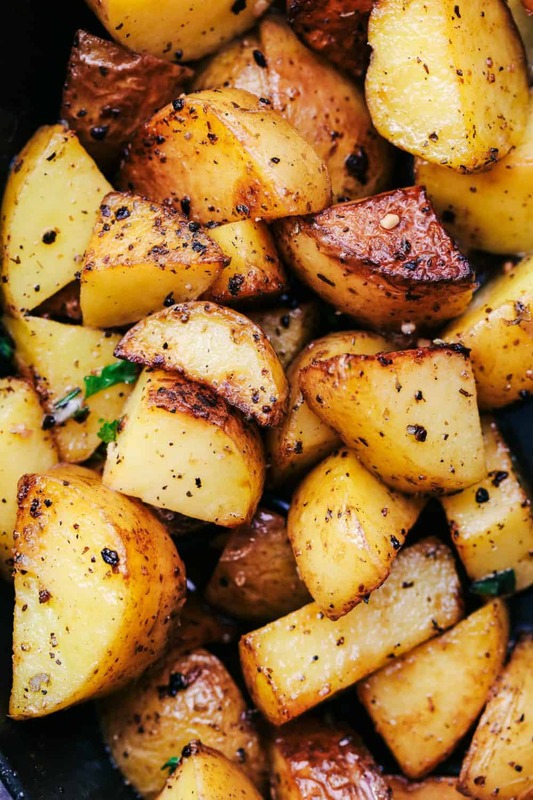 You start by cooking the potatoes in a delicious garlic herb butter. It really brings amazing flavor to these potatoes. Garlic herb butter potatoes? My heaven. Let the steak sit at room temperature for 30 minutes. Season the steak generously on each side with salt and pepper. In a cast-iron skillet with 1 Tablespoon of oil over high heat add the steaks to the pan and sear each side 3 minutes or until brown. Reduce heat to medium low. Cook the steak to desired doneness. Rare = 125 degrees, Medium Rare = 135 degrees, Medium = 145 degrees, Medium Well = 150 degrees and Well Done = 160 degrees. Some say to flip only once while cooking, I like to flip mine a few times. Right before serving the steak slather the butter compound on top and let it melt into the tender steak. This gives it a nice finishing touch and adds such great flavor. I used to like my steak well done but now I like my steak more medium or medium well. It just seems more tender and melt in your mouth this way. So I cook the steak to about 145 degrees. 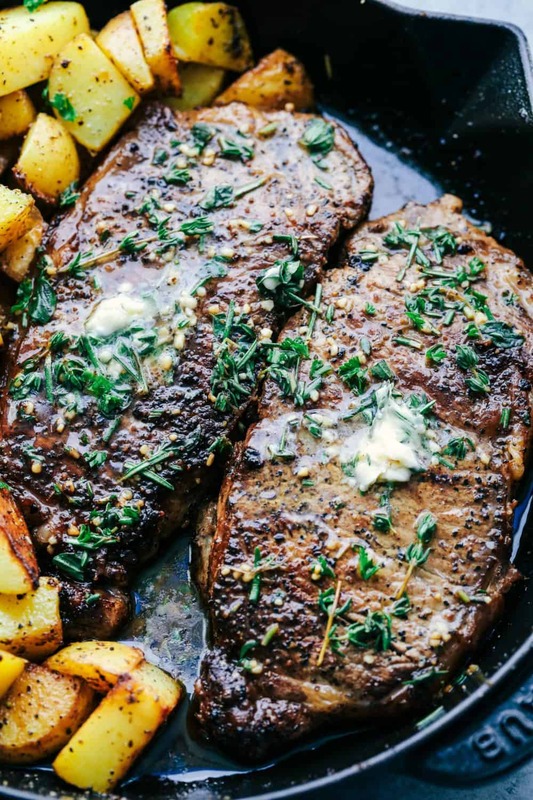 The best part about this steak is the garlic butter herb compound that you slather on the steak right at the end. It just melts into the steak and gives it such incredible flavor. This skillet steak is easily the best steak that I have had. Cooked to tender and juicy perfection and the butter garlic herb flavor is unreal! Your family will love this skillet meal. 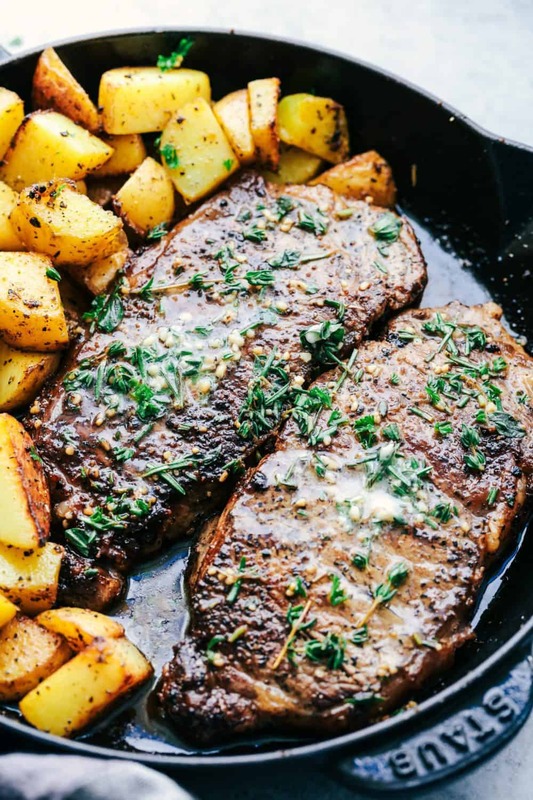 In a large cast iron skillet over medium high heat, add olive oil and butter, potatoes, garlic, thyme, rosemary and oregano. Cook for about 3 minutes, stir and cook and additional 3 minutes or until fork tender. Remove and set on a plate. Delicious recipe but the cook times for the potatoes are seriously misjudged. I was skeptical at first glance but decided to try it this way anyway. After 6 minutes I still had completely raw potatoes. It took ~25 minutes to cook them until they were tender. Otherwise, super easy and yummy! I had to finish the potatoes in the microwave to completely cook them. I also had difficulity with the garlic and herbs burning. My suggestions are that the potatoes be cooked in the microwave for 3 minutes and then add to the butter and oil (without the garlic and herbs) to brown and finish cooking. I would then take out the potatoes and add the steaks. I cooked them 9 minutes at med low for med rare. Take the steaks out and add the butter herb mixture to the pan and salute the garlic and herbs for about 30 seconds. Add the steaks back in and baste with the sauce. Add potatoes back in to heat through. The steak and potatoes were fantastic. Going to replace potatos with squash. The potatoes were under cooked and the steak was over cooked. Also, there was not very much flavor on the steak. Made this awhile ago & it was so yummy hubby requested it for his bday dinner tonight! But I can’t remember if I used salted or unsalted butter! Which should it be? Yes, that sounds delicious! Thanks for following along with me! I made this for the first time last night. It won’t be the last. We substituteed a nice london broil and it was delicious!! I am so glad. I love this as well. Thanks for the comment and for following along. I am so happy that you loved the recipe. I have a pretty thick sirloin steak (2″). What would be the total cooking time for med rare? The best way to know is using a meat thermometer since every slice of steak measures and cooks differently. I too like a medium – medium well steak & glad I’m not the only one! I’ll check temperature, but when you say you cooked for 10 minutes, was that total or an additional 10 after searing it for 3 minutes on each side? An additional 10 after searing it for 3 minutes on each side. Would the recipe work with preserved dry herb instead of fresh as well? It does but it does add more flavor and taste with the fresh herb. Hi…going to try this tonight, but wanted a clarification: The first half of this post says to reduce to medium low, and the second half says to reduce to medium high. Typo? I’m assuming medium low is the correct temp. I like med rare my partner likes med well. How to cook 2 different steaks perfect same time? You can cook at the same time but take the medium rare out first and cook the med well a few minutes longer while you are plating up the dinner. It will turn out warm for both of you and delicious! Do you skin the potatoes? For this recipe, I left the skins on the potatoes. You are welcome to skin them if you prefer though.